Just a nicer way of marking spoilerz without a foot long post. Thanks twiggy, glad you enjoyed it. BTW, I use purple switch puzzlez in most of my levelz, these are great because require thinking. Would someone please (re-)play this CL, and do a screen grab of the Statz Page showing a "PERFECT!" result? Send the JPEG attachment in e-mail with any other data to GooRoo@marinersmvp.com. I have the enemy gruntz with go cart in the purple pyramidz,and the other 2 greens gruntz in the otrhers 2 purples piramidz, but the purple piramid with the go cart not lower , why? I have changed the rating of this Custom Level from "Medium" to "Frustrating". I detest any puzzle that containz totally random action requirementz in order to proceed to the next mini-puzzle! Bad enough is using a Wingz grunt to 'entice' one or more enemy gruntz into taking a certain position (as on Purple Multi-Grunt Switchez , or Hold Switchez of any sort), but to have to give an enemy grunt a mobile toy and have him end up on such a Switch is nothing but frustrating!!! 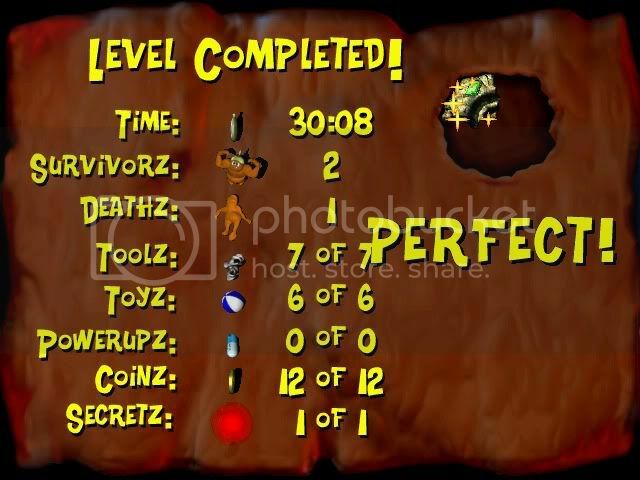 No wonder there have been so few reportz of any sort of success on this Custom Level! I only tried to play it because there is no Statz Page image available ... but refuse to even try any puzzle of this nature in the future. As soon as I detect such a mini-puzzle, it goez into my (personal) trashcan, and getz a "Frustrating" rating for this Forum. Be advised! Random mini-puzzle(z) = "Frustrating" rating! The problem with that solution is that the solver must somehow manage to get him onto the Purple Multi-Grunt Switch in the first place! That mobile toy has a totally random action ... there is simply no way to force him to drive to that PMGS!!! I have neither the time nor the patience to try dozenz of timez to have something random, such as this, to happen before I can even begin to solve any true puzzle! Designerz: This illustratez an automatic "Frustrating" rating! That's not how it works. I'm quite sure I remember how this thing is. B = blocking tile; F = free tile; S = switch. Have the grunt with the toy attract the enemy to the left F, with your grunt standing in the switch. Let your grunt be hit, then walk upwardz and give the toy to the enemy. Your other grunt should be standing left of the lower F, and should quickly go right, just before the enemy receives the toy. The toy then breaks, and you have time to walk away, and the enemy will remain pressing the switch. If this isn't the situation, I'm sorry, I may have confused it with a ToyLand (I) puzzle. But I'm sure I have never done any puzzle that relies on luck and randomness - there's always a trick. Edit: looking at the map now, apparently the puzzle(z) are slightly different from what I described, but they follow the same concept - trap the enemy grunt immediately when giving him the toy. And what BattlezM said two years ago that you just quoted, was correct. There are three Red Pyramidz, two lowered and one raised at the beginning of the puzzle. ... and the enemy grunt then drivez out over the (now) lowered Red Pyramid, and movez in a random manner, seldom returning to the Purple Multi-Grunt Switch. There can be no assured method of leaving the enemy grunt with the toy breaking while on the PMGS ... it can break one tile away, even with the solver's grunt on the Red Hold Switch. The solver's grunt would have to step off the Red Hold Switch to the ordinary tile, and (when the toy breakz) move out of the detection range of the enemy grunt. Bad design! Unless the desired action can be reliably repeated time after time, it is merely being cruel to the solver. Oh, I see what you need to do. First attract him to the snow tile below the red switch, and stand on the switch. Give him the kart, and his only movement option is to ride down to the purple switch. Immediately walk down. Leaving the red switch will then raise the pyramid next to the purple switch, and since you'll be above him, he cannot move anywhere... and thus, his toy breaks. Wait why is this still classified as frustrating? I already provided the solution to the first puzzle. You just need to stand below the switch, get hit by the enemy, then walk up. He will go to where you were before (below the switch), and you then give him the toy. His only movement option is the purple switch. As he drives to it, move to where he was - the pyramid next to him will raise and you will be above him. Thus he has no more movement options and his toy breaks. There is nothing frustrating here, you just need to go in the proper spotz. I am just now reaching the point where I may spend some time on previously released Custom Levelz that I never completed ... to see if "a fresh brain" (and the commentz made in some threadz) may result in a re-evaluation of the difficulty level. I just completed updating GooRoo's Gruntz - The Journey home to extend the copyright datez, etc. ... and to add in linkz for downloading the Custom Quest & Battle Levelz. BTW, the linkz for several of those CLz that were moved into "Masochistz" seem to point to the original graphicz set area, rather than to the "Masochistz" area ... so I have more minor work to be done, to correct that ... after I do the re-evaluating. Since those linkz were taken directly from the indicez, the indicez on this Forum will need to be corrected for any CL that changez their difficulty rating. Level'z not frustrating at all. Should be in Medium, hard at the MOST. Perfect @ 30~ minutez. Only one part stumped me for a while, and that was getting an R, but that'z because I didn't think I could get it; I just had to shoot the Spongez from the right spot. Like SG said, there IS a trick to the first part with the Sword Grunt and Toy; you just take a hit, get him in position, give him the Toy and move down, and pick up the Zap Cola on the other side. As long as you know and use the CRTL + # trick throughout most of the level, you shouldn't really have a problem with it. Pleaaase release a walkthrough for this one ! !